In addition to making cool stuff, my one other passion is music. In this instructable, I've decided to combine my love for building things and my love of music into the ultimate project: an electric ukulele. I originally intended to build a guitar, since that's the instrument I'm most comfortable playing, but I soon decided it would be much cooler to build an electric Ukulele. Specifically, my ukulele is a semi-hollow body ukulele, which, as you might have guessed, means it's partly hollow on the inside. If you'd like to learn how to build a solid-body ukulele, you should check out outdoorgirl16196's instructable. Lastly, If you like this project, please be sure to vote for me in the Invention Challenge! I'd really appreciate it. But enough chit-chat. Let's get down to business. First step: getting inspiration! The easiest way to get inspired is to look at pictures of different guitars to see what design elements pop out at you. I've always loved the design of the Gibson es-335 guitar, so I decided to channel that into my Ukulele. I'm going to show you the steps I took to build this particular ukulele, but feel free to make your own design. Once you have a general idea in mind, it's a good idea to make a rough sketch of your design. To learn more about design sketching, you should check out JON-A-TRON's design sketching class. It has a lot of really good information on the design process. A back layer, also made of plywood. Once you've gotten an idea down, it's on to the next step: choosing your materials. Whatever color spray paint you want the ukulele to be. The template is where it all begins; it's the DNA of the project. Although you’ll find many different ones, the purpose of every template is to serve as an outline for your Ukulele. Since I was essentially building a ukulele based on a guitar, this made my life a lot easier. 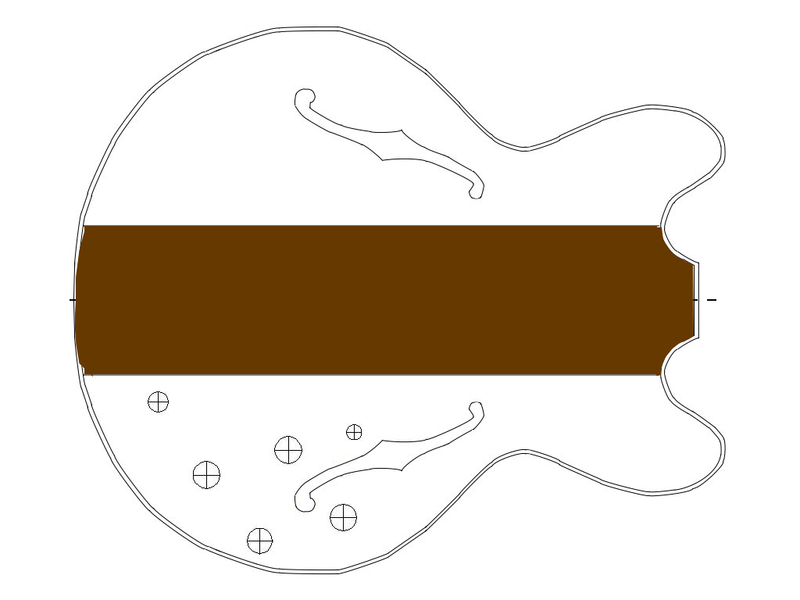 Rather than have to draw up my own template, I just used an es-335 guitar template online and scale it down to a size suitable for a ukulele. I ended up using this very basic guitar template . Although it did get the job done, you can find much better templates online if you just know where to look. One of the best websites I’ve discovered for free guitar templates is this one. It's a goldmine of highly detailed guitar templates, from acoustic guitars to double neck electric guitars. Once I picked out my template, I opened it up in Adobe Acrobat and scaled it down. I have an acoustic Ukulele at home, so I used that as a guide to properly scale. I actually found cutting these two parts surprisingly difficult. For lack of a better tool, I used a jigsaw, which made it hard to get a nice, clean cut. One problem that kept happening to me was "tearout," which is when you get a ragged edge after making a cut. Luckily, Instructables has a wonderful woodworking class, which, among other things, shows you different ways to prevent tearout. If you don't feel like taking an entire online course though, one way to prevent tearout is to flip the plywood upside down before cutting it. The reason this helps is because tearout only happens on one side of the wood (the side facing you as you're cutting), so by flipping the board before cutting it, the tearout will be on the less noticeable side. I found this tip especially helpful when cutting out the f-holes. Once I had both pieces cut out, I smoothed the edges using my orbital sander. Although the front and back layers form the basic shape of the body, it's really the middle layer that gives the body dimension. On a regular guitar, this layer would be bent out of wood, but unfortunately, I didn't have the right tools for that, so I had to get a little bit creative. I decided that rather than bend the wood, it would be easier just to cut out several chunks of wood and glue them into the desired shape. I used the front layer that I cut in the previous step as a guide. I also cut out little "handles" coming off from each piece (which I eventually cut off) to make the clamping process easier. Once I was done with the outside layer, I cut out a large block of wood and glued it into the middle. This step is optional though; you can choose to have your ukulele be entirely hollow, or you could make it semi-hollow, like I did. It really just depends on what tone you want to get. For a more in-depth look at the difference between hollow vs semi-hollow bodies, Gibson.com has a great article explaining the difference. Next, I glued the front layer from the previous step on top. I used wood glue and sanded all the edges once glued together. Once the basic shape of the body was finished, I started working on the neck. Making the neck was probably my least favorite part of this whole process, just because it's so easy to mess up. For this reason, many luthiers prefer to buy a pre-made neck. I started by cutting out a piece of wood in the rough shape of a neck, using my acoustic ukulele as a guide. Next, I formed the headstock by gluing a block of wood at the end of the neck, and then marked the angle at which I wanted the headstock to be. I then cut along the marked lines using a jigsaw. Although I didn't know this at the time, the angle of the headstock on a Gibson es-335 is exactly 17 degrees. I just kind of eyeballed an angle that looked right, but if you end up making your own electric Ukulele, I'd be interested to see if it makes much of a difference what the angle is. Once the basic headstock shape was finished, I cut out a portion at the bottom of the neck, trying to cut as precisely as possible, since this was the part where the neck would be glued to the body. While I did have a general list of materials and tools, I was severely limited on clamps. Instead, I ended up using any heavy item in my garage as a weight, which turned out to be a pretty terrible idea. It was for this reason that I made the fatal accident of gluing the neck on at an angle. After all the work of making the body, making such a big mistake was so discouraging that I nearly felt like giving up then and there. Gluing the neck on straight is probably the most important part of building a string instrument, and I had screwed it up. A crooked neck negatively affects not only the appearance of the finished product, but also the comfort/playability for the player. But alas, what was I to do? I decided to just continue and use this as a learning experience. They say that average people learn from their own mistakes, and smart people learn from other people's mistakes. So when making your electric ukulele, learn from my mistake and don't skimp out on the clamps. It'll keep your work a lot neater and will help you avoid mistakes like mine. After the stress of making and gluing the neck, painting the ukulele was a relief! I chose to stick to the classic cherry-red color of the es-335 that many guitarists, including Chuck Berry, were fond of. There are many iconic paint jobs that you can take inspiration from though, like Eddie Van Halen's "Frankenstrat" or the classic "Vintage Sunburst" effect. When painting the ukulele, you have two choices regarding the paint job: polyurethane or nitrocellulose finish. Polyurethane is the cheaper of the two and is commonly used in Fender guitars, while Nitrocellulose finish is more expensive and used in high-end guitars. Nitrocellulose is also a lot harder to work with, and I've heard horror stories of nitrocellulose taking up to a year to fully cure. So for me, polyurethane was the obvious choice. I first applied masking tape to the portions of the ukulele I didn't want painted, then lightly sanded and washed the bare wood of the ukulele. Once that dried, I applied about four coats of white primer, allowing the paint to dry completely in between coats. I also used fine wet/dry sandpaper between each layer to ensure the smoothest quality possible. I used progressively finer grit sandpaper as I started applying the red paint, starting at 600 grit and ending at 2000 grit. In all, I applied about 4 layers of red paint. I also applied some white paint to the edges, after which I applied several coats of polyurethane coating to the whole thing. For a more detailed look at painting a guitar, This guy has written a great instructable on how to achieve a mirror finish, by using a combo of rubbing compound, guitar polish, and jewelers rouge. My original plan was to wind my own pickups, but that soon proved to be more trouble than it was worth. The way pickups are made is by winding a hair-thin copper wire around a magnet several thousand times, until the pickup becomes electromagnetic. After attempting to do this and then having the wire snap on the 2,623rd wind, I threw the unfinished pickup at the wall, lit my entire house on fire in a fit of rage, and then came to my senses and just bought a pair of pickups online for ten dollars. This brought up a new challenge though, because I had cut pickup cavities in my ukulele only big enough to fit the size of my homemade pickups. The pickups I bought online were too big to fit the cavities I had cut, meaning I would have to make the cavities bigger. Add the fact that my ukulele was already painted, and that I was armed with only a jigsaw, and this made it very easy for the ukulele to get damaged. I was lucky enough to get away with just a small chip in the finish, but really, it could've been much worse. I don't have any pictures from this step, but if you plan things well enough you shouldn't have to go through this ordeal. Basically, there are two wires coming off of each pickup: a bare wire and a colored wire. The bare wire is to be soldered to the back of the volume pot and the other wire to the outside terminal of the volume pot. I also cut a small hole in the side of the ukulele to make space for the output jack. I also secured the output jack with 2 strips of thin sheet metal. electronics are in working condition beforehand - once you glue the back, there's no going back! I also finished this step off by putting some silver knobs on top of the potentiometers to give it a nice look. Once you have everything done, there's still one more thing you need to fret about: making the frets. Not only do you need to figure out what material to use for the frets, but you also need to figure out the distance between each of the frets, and how you're going to attach the bridge and the nut. I first started by gluing the bridge and the nut to the ukulele with a 2-part epoxy. It doesn't really matter too much the exact distance between them; you just need to put them in a fixed spot so you can calculate where the frets are going to go. The distance between my bridge and nut ended up being around 18 inches. To calculate where the frets go, you can use stew macs' fret calculator. Just enter the scale length into the calculator and the number of frets you want, and it'll tell you exactly how far apart all the frets should be. I actually used welding rods for the frets. I just removed the flux and trimmed them to the correct size. I used an X-acto knife to cut out the slots for the frets, and just to be safe, I tested each fret to make sure it was in-tune. I then glued each fret down with a 2-part epoxy. Well there you have it! Your very own electric ukulele. Overall, I think mine turned out pretty well. There are some intonation issues, and if I did it again, I would definitely do lots of things differently. Still, it was a really fun mental challenge, because every time I solved one problem, another problem presented itself. Anyways, thanks so much for reading, and don't forget to vote if you haven't already!! Upper Bout Width: 7 11/16"
Waist Bout Width: 6 1/8"
Lower Bout Width: 10 7/8"
Length, from top of curves to the bottom: 13 1/8"
Width at fret one: 1 7/16"
Width at fret twelve: 1 7/8"
From the headstock to the start of the nut: 4 1/2"
Nut to Saddle: 17 5/8"
Total length of Uku: 26 1/4"
Awesome 'ible! Good luck in contest! Stupidly bought nylon strings and the pickups didn't work... so if you can let me know that would be great? I just used guitar strings. For the "a" string on the ukulele, I used a high e string from a guitar. For the e string on the ukulele, I used a "b" string from a guitar. for the c string on the ukulele, I used a g string from a guitar, and for the g string on the ukulele, I used another high e string. Also, I don't know what kind of bridge you have, but normally there are holes where you thread the strings through. Anyways, good luck! If you have any more questions, feel free to ask! also, I'd love to see it when it's done! oh about the measurements ... not the scale cause thats confusing to me . i know that the scale size for Soprano is 35cm .. whats the height on top,( where is curves) what the size on the neck and the size of body and finally the total size of it. I'm afraid my ukulele is a tenor, so my measurements won't help much if you're building a soprano. If you're building an ukulele though, you should probably do some research on scale length, because it's really important, and the measurements need to be extremely precise. But if you know the scale length on a soprano is 35 cm, just enter that into stew mac's fret calculator and it'll give you everything you need to know. You wrote the neck thickness is 3/16" is that correct or is it 13/16? Woops! sorry, I meant 13/16". I just double checked everything and it should all be good now. Just what are the final dimensions? And can u play this like a normal uke meaning can u play regular songs? What kinds of things would you do differently? Amazing job! May I suggest you Google cigar box guitars. I have built several and you are definitely on your way. I especially like how you made the body, I'm gonna borrow that idea. I hate to be pedantic, but you haven't made a ukulele, you have made a small guitar!